“Palazzo Ducale“. Lithography with original hand colouring, made approx. 1860 by Eugenio Testolini in Venice. Size: (image) 37,5 x 55 cm (paper: 49 x 63 cm). 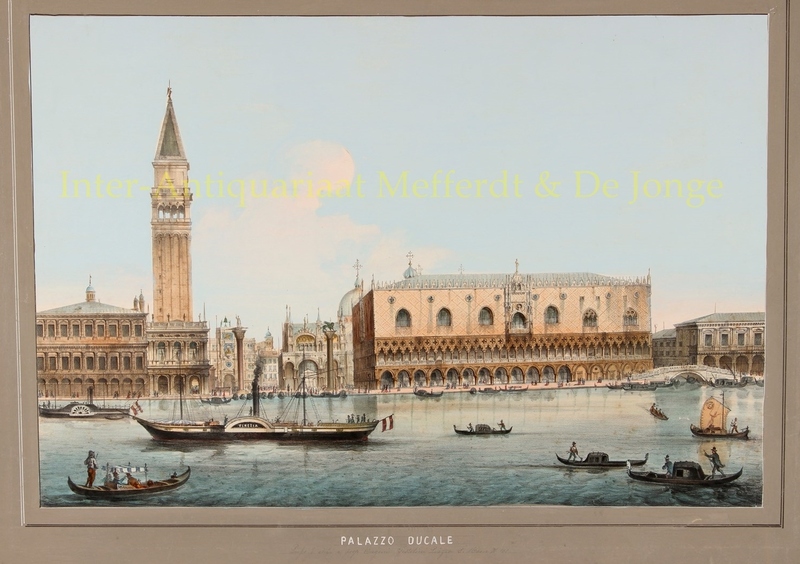 The view depicts the city in those turbulent times, when in 1848-1849 a revolt had briefly re-established the Venetian Republic and in 1866, following the Third Italian War of Independence, Venice, along with the rest of the Veneto, became part of the newly created Kingdom of Italy. With from left to right the Palazzo della Zecca (which once housed the official government mint); the Bibliotheca Marciana (behind the library we see the Campanile di San Marco); the Piazetta di San Marco with the granite columns (between which death sentences were carried out) carrying St Theodore and the Lion of Venice (the city patrons) and in the back on St Mark’s Square the Clock Tower leading to Rialto and St Mark’s Basilica; along the Molo (the quay fronting the lagoon) we see the Doge’s Palace and across the bridge to the right the Palazzo delle Prigioni. In the lagoon there are two paddlewheel steamships, one pumping out a black funnel of smoke, as well as numerous gondolas rowing their customers across the water. Although tourism had been an important sector of Venetian industry since the 18th century, when it was a major centre for the Grand Tour, with its beautiful cityscape, uniqueness, and rich musical and artistic cultural heritage. In the 19th century, it had become a fashionable centre for the rich and famous, often staying or dining at luxury establishments such as the Danieli Hotel and the Caffè Florian. With this fine lithography Eugenio Testolini, who had a shop on Piazza di S. Marco, catered to those wealthy tourists. Venice today is still regarded as one of the world’s most beautiful cities and attracts an estimated 50.000 tourist per day.